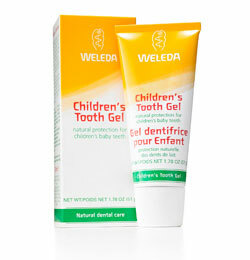 Golden coloured, this delicious tasting toothpaste has instant appeal with children. It is specially formulated to help keep the flora of the mouth in natural balance and regular use helps protect against plaque buildup. The natural Silica gently but thoroughly cleans. Calendula flowers give the gel its golden colour and help keep the gums and oral cavity healthy. Deliciously flavoured with pure essential oils of fennel and spearmint, the gel is naturally thickened with Glycerin and seaweed-derived Algin. Apply a small amount of toothpaste to a dry toothbrush, and brush over the teeth and gums for a thorough cleaning. Glycerin, Water, Hydrated Silica, Calendula Extract, Algin, Fennel Oil, Spearmint Oil, Aesculin.